A couple of days ago, prompted by thee APOD of November 21, 2016, I finally took the effort to look for the second relatively-bright and recently-discovered nova in the constellation Sagittarius, PNV J18205200-2822100. It was discovered on October 25, 2016, five days after the nova TCP J18102829-2729590, was discovered on October 20, 2016. The former had reached magnitude 5, while 2.5 degrees away, the latter reached magnitude 8 around the time I spotted it on October 24, 2016 (scroll down this page for more on that). Anyway, on November 21, 2016, I headed to the baseball field complex in Maple Shade, NJ, to spot Mercury, which I did at 4:58 pm EST, then Saturn 4.2° straight above Mercury at 5:03 pm (in both cases, with 16x70 binoculars in relatively bright twilight after sunset at 4:39 pm). I waited a bit for the sky to darken somewhat before looking for the nova. Starting at bright and obvious Venus with the 16x70s, I worked my way across the lid of the Teapot asterism in Sagittarius, Phi to Lambda to Delta Sagittarii. At 5:32 pm, I thought I spotted Nova PNV near Delta, and thought I confirmed it at 5:37 pm when it became dark enough to see a couple of nearby field stars. Subsequently, on November 22nd, I was looking at the initial close-up picture of the nova and nearby stars that I posted. By measuring the spacing between them on the picture and on a SkyTools chart, I realized the presumed nova didn't exhibit the right spacing. Instead, a magnitude 6.2 star did fit (HD 168646). It appeared I had mistaken this star for the nova. Then it dawned on me to check the AAVSO magnitude estimates for the nova and found that by November 21st, it had dropped to the neighborhood of magnitude 9 (vs. "near the limit of naked-eye visibility last week" as described in the APOD text). There's now no doubt that I did not see the nova and mislabeled it on the initial pictures posted here. The picture above is correctly labeled based on this further study (mouseover for labels). It was captured at 5:49 pm with a Canon 6D digital SLR camera on a fixed tripod and a Canon 100 mm f/2.8L macro lens. Exposed 1/2 second at f/2.8, ISO 3200 (exposure limited by residual twilight and general light pollution). Cropped to about 22% of the original size. Here's the rising Gibbous Moon (2°02' altitude) at 4:47 pm EST on November 13, 2016, 14 minutes after moonrise and roughly 16 hours before Full Moon at 8:52 am on November 14th. Because the moon will be at an unusually close perigee at 6:21 am on the 14th (356,509 km or 221,524 miles per the U.S. Naval Observatory's MICA software), this has been a widely (or wildly?) touted "Super Moon." This anti-scenic location at the old Mart site in Pennsauken, NJ, was picked for its low eastern horizon, and because I've made many low-altitude spottings of various celestial objects from here (usually in the morning before sunrise). In any case, the moon really didn't look especially large or bright to me, but that might reflect my generally unimpressed view of the super moon business. The picture certainly doesn't show any "largeness." However, perhaps more interestingly, notice the nice Belt of Venus, the pinkish band above the darkness of the earth's shadow along the horizon. Taken with a Canon 6D digital SLR camera and a Canon 100 mm f/2.8L macro lens on a fixed tripod. Exposed 1/125 second at f/3.2, ISO 100. Cropped in the vertical direction (only) to a 16:9 ratio and a field about 20° wide x 11.5° high. Here's a wide-angle view from the same position at 4:54 pm EST when the moon was at 3°14' altitude. Taken with a Canon 6D digital SLR camera on a fixed tripod and a Sigma 20 mm f/1.4 Art lens. Exposed 1/125 second at f/5.6, ISO 800. Cropped in the vertical direction (only) to a 16:9 ratio and a field about 84° wide x 52° high. In this view, the moon doesn't look "super" at all. What is amazing is how many interesting astronomical observations I've made from this arguably dingy, very non-bucolic location. Here's a telephoto view at 5:00 pm EST when the moon was 99.2% illuminated. Taken from the Mart site with a Canon 6D digital SLR camera and a Canon 400 mm f/5.6L lens on a fixed tripod. Exposed 1/320 second at f/6.3, ISO 800. It was cropped to 22% of the width x 25% of the height of the original, yielding a field about 1.1° wide x 0.84° high. It's certainly not as crisp as the lunar image below, taken on the previous night. Besides the difference in focal length (400 mm here, 960 mm below, then cropped to roughly the same final size), it was also very low at 4.3° altitude vs. 50° for the picture below. Unfortunately, the low altitude by itself invalidates any direct comparison of sharpness and details. On November 12, 2016, the 96% illuminated waxing Gibbous Moon was 13.3 days old and 1.5 days before full when this image of it was captured at 8:44 pm EST from Maple Shade, NJ. It was taken with a Canon 6D digital SLR camera and a William Optics 80 mm f/6 triplet apo refractor plus a Kenko doubler yielding an effective focal length of 960 mm. This single frame was exposed 1/1250 second at f/12, ISO 1600, daylight white balance. It was cropped to 51% of the width x 58% of the height of the original, yielding a field about 1.1° wide x 0.83° high. At the time, the moon was at 50° altittude. The upcoming full moon at 8:52 am on November 14, 2016, has been widely described as a "Super Moon" because it occurs just 2½ hours after perigee, a particularly close perigee in this case (356,509 km or 221,524 miles geocentric/selenocentric at 6:21 am), the closest since 1948, so it will be larger in apparent diameter and brighter than usual, but it's unclear if the effect will really be visible. From the Philadelphia area, the moon will be about the same half-day time span from the moment of full on both Sunday evening the 13th and Monday evening the 14th around 9 pm, but early risers on Monday can see it closer to full if they look before moonset at 6:29 am (for 40°N-75°W, nominally Philadelphia). One could also theoretically see the moon at the moment of perigee, but with it setting just 8 minutes before perigee, you'll need a clear sky and a low, unobstructed horizon. If visible near the horizon, the moon will look large, but most of that due to the moon illusion. In any case, it was a good excuse to take a test picture of the moon with the scope and doubler, a setup I haven't used in a while. It's also the first time I've used my new Benro A373FBS8 tripod and video head with this camera+scope setup. It worked well. Compared to my old Manfrotto tripod and video head, the new head tilts to a steeper vertical angle and the counterbalance control is effective, plus the tripod is tall enough to allow viewing the camera's rear screen when tilted, and it's sturdy. On November 2, 2016, the 3.2-day-old waxing Crescent Moon joined the planets Venus and Saturn in the southwest after sunset (mouseover for labels). Clouds and haze were present too, but some earthshine is just visible on the dark portion of the 9% illuminated moon. Venus was about 7° from the moon, Saturn was about 3° from the moon, while Venus and Saturn were about 5.3° apart. Taken from Strawbridge Lake in Moorestown, NJ, at 6:36 pm EDT with a Canon 6D digital SLR camera on a fixed tripod and a Sigma 70-300 mm f/4-5.6 zoom lens set to 133 mm focal length, yielding a field nominally 15° wide x 10° high. Exposed automatically 1/6 second at f/4.5, ISO 1600 with auto white balance. The camera was set with -2/3 stop compensation, and this frame was auto-bracketed -1/3 stop from that. No processing was applied besides size reduction for this web page. The image below is a 16:9 crop, 67% horizontal x 56% vertical, of the original 3:2 image above. This effectively magnifies the area of interest (the resultant field is about 10° wide x 5.8° high) and better shows relatively dim Saturn (mouseover for labels). Saturn was at magnitude +0.5 vs. -4.0 for brilliant Venus, so at the time, Venus was 63x brighter than Saturn (not including any effects from the clouds and haze). Saturn was not convincingly observed visually during the session. In the early morning twilight on October 28, 2016, the 27.4-day-old waning Crescent Moon, resplendent with earthshine, was paired closely with the bright planet Jupiter and several stars, including Porrima (Gamma Virginis). Mouseover for labels. When this picture was captured at 6:36 am EDT, the moon was about 5% illuminated and 55 hours before the next new moon on October 30th at 1:38 pm. The moon was at 13½° altitude, and center-to-center, it was 1°03' from Porrima and 1°19' from Jupiter. Looking closely at Jupiter, right of the moon and slightly above it, several of its satellites are also visible (see the picture below for details). Taken from Maple Shade, NJ, with a Canon 6D digital SLR camera and a Canon 400 mm f/5.6L telephoto lens on a fixed tripod, then cropped to about 67% of the original dimensions for a field 3.4° wide x 2.3° high. Exposed 0.8 seconds at f/7.1, ISO 1600. The picture below is a 16% crop, centered on Jupiter, of the same original as the picture above, yielding a field 0.82° wide x 0.55° high. All four Galilean satellites of Jupiter are present, as well as a field star. However, Io and Ganymede are essentially superimposed, so the dot above Jupiter representing them is elongated slightly to the upper-right (Ganymede was about 8 arc seconds from Io). Mouseover for labels. Below that is a screen clip from WinJUPOS for the same time (but labeled in UT). It's cropped close to Jupiter, so the more distant star and Callisto are excluded. On October 28, 2016, while taking pictures of the Moon, Jupiter and Porrima grouping, I also took some pictures of the camera setup I was using. I finally got around to copying them from my Apple iPhone 5s on November 6th. The picture on the left was taken with existing light at 6:23 am EDT (exposed 1/15 second at f/2.2, ISO 2000), so the noise is quite pronounced after brightness enhancements were applied (the camera and tripod were barely visible in the very dark original picture). It shows the Canon 6D camera with a Canon 400 mm f/5.6L telephoto lens on a Benro TMA48CL graphite tripod with an Acratech GV2 open-ball head in the gimbal position (which works quite nicely with the long focal length lens). The moon and Jupiter are prominent in the background sky, while Porrima is lost in the noise. The picture on the right was also taken at 6:23 am, this time with the "flash" turned on (actually a bright LED that comes on momentarily). It was exposed 1/16 second at f/2.2, ISO 100. I was using a Canon RC-6 infrared wireless remote to trigger the 6D, so there's no wired remote dangling from it. Update October 29, 2016: I went to the old Mart site in Pennsauken, NJ, to look for the even older crescent moon before sunrise. With 16x70 binoculars, I spotted it along the edge of the distant tree tops at 6:19 am EDT, 6 minutes after it rose at 6:13 am (by definition, rise and set times for the moon occur when the upper limb reaches the horizon, so in this case, the illuminated lower limb would be a couple of minutes behind). When first spotted, the moon was 31 hr 19 min before new (Oct 30 at 1:38 pm). Within a minute, the thin, wiggly, darkly yellowish crescent was visible to unaided eyes. I followed it for at least another half hour at the Mart and while driving home. On Monday, October 31st, the nominal 30-hour-old crescent moon should be visible after sunset if the weather permits. Currently, the slope of the ecliptic after sunset is relatively shallow vs. the steep slope before sunrise, so the evening moon won't be as high as the morning moon for a similar time span from new. I also observed Jupiter with the 16x70s while at the Mart. Offhand, it appeared as if there were four Galilean satellites present; however, I wondered if the star HD 110123 remained. I checked SkyTools and indeed, the star was still nearby in line with Jupiter's moons, but now it was west of them (Jupiter had moved eastward since yesterday). Europa, Callisto and Ganymede were visible, but Io would begin transit at 6:28 am, so it was lost in Jupiter's glare at 16x. Therefore, I was actually seeing three Jovian satellites and a star. Update October 31, 2016: I went to Swede Run in Moorestown, NJ, to look for the nominal 30-hour-old moon after sunset. However, there were streaky horizontal clouds along and above the western horizon (they resembled greatly magnified Jovian cloud bands). I could not find the thin crescent while looking at apparent gaps in the clouds with 10x50 binoculars between about 6:00 and 6:45 pm. Late in the afternoon on October 24, 2016, I saw an online Sky & Telescope article about a recently-discovered, fairly bright nova in Sagittarius (currently about magnitude 8), so I headed to Swede Run in Moorestown, NJ, for a look at what has been temporarily designated TCP J18102829-2729590. Sagittarius is now low in the southwest at the end of twilight, so there's no time to dally. Finder charts are available at the S&T link above. As soon as I arrived, I set up my mounted 16x70 binoculars, and was able to find it easily at 7:45 pm EDT (astronomical twilight ended at 7:38 pm). The compact, slightly-curved row of three stars above the tip of the Teapot's spout make's a distinct skymark. This image was captured at 8:03 pm when the nova was about 10° altitude (corrected, I originally had it at 15.5°). Taken with a Canon 6D digital SLR camera and a Canon 100 mm f/2.8L macro lens, then cropped to 42% of the original size for a field about 8.5° wide x 5.7° high. Exposed 2 seconds at f/4, ISO 1600, 3600K white balance. Mouseover for labels. 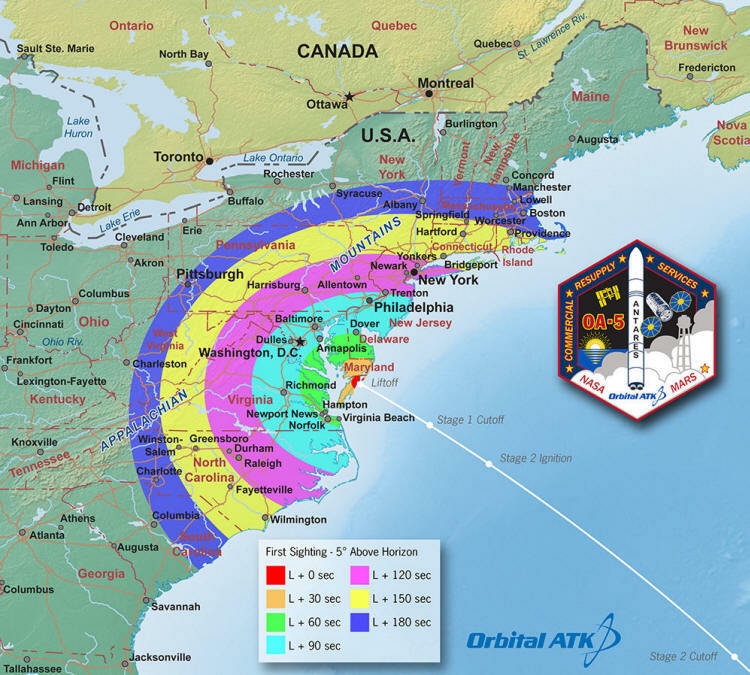 On October 17, 2016, this much-delayed launch finally occurred at 7:45 pm EDT. I observed it from Borton Landing Rd in Moorestown, NJ, using unaided eyes and my mounted 16x70 binoculars. I decided not to take any pictures (I didn't want to distract from my visual observations, and at best, any pictures would have just shown a steak in the sky). Some more details here. These two planets continue to separate and were 6.2° apart on October 15, 2016, when this picture was captured at 6:37 am EDT from the old Mart site in Pennsauken, NJ. 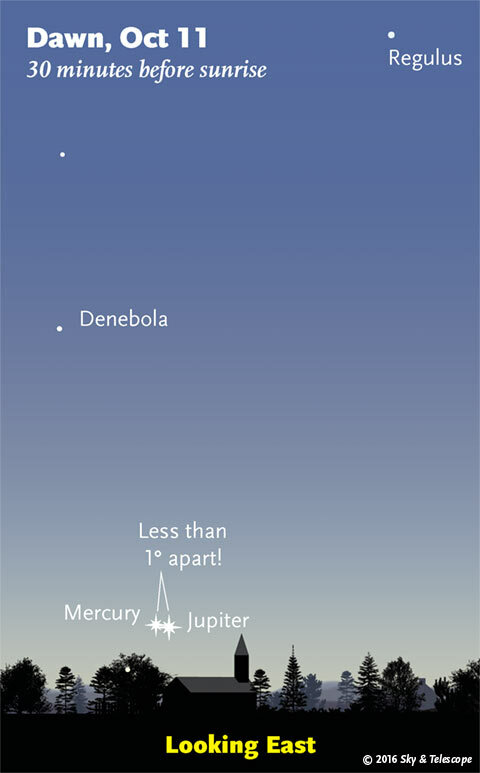 Magnitude -1.7 Jupiter was easily visible to unaided eyes at 7.4° altitude, while magnitude -1.2 Mercury required binoculars to be seen in the murkier twilight sky at 1.9° altitude (and 8.8° solar elongation). It's barely visible between the wires to the right of the radio tower (mouseover for labels). Taken with a Canon 6D digital SLR camera and a Canon 70 to 200 mm f/2.8L lens, set to 200 mm focal length) on a fixed tripod. Cropped lightly in the vertical direction to a field 6.8° wide x 8.5° high. Exposed 1/250 second at f/3.5, ISO 3200; auto white balance. The picture below is a greater crop of the picture above (to a field 3.0° wide x 2.5° high) and shows Mercury more clearly to the right of the radio tower (mouseover for label). This will probably be my last attempt at spotting Mercury before superior conjunction on October 27, 2016. The two planets were again 1.7° apart on October 12, 2016, but this time (compared to the picture below), Jupiter was above and Mercury was below when this image of them was captured at 6:31 am EDT from the railroad tracks in Maple Shade, NJ (interestingly, the camera's GPS indicated the spot was 0.2" west of being exactly 75° west longitude, about 16 ft). At the time, magnitude -1.1 Mercury was at 3.4° altitude and magnitude -1.7 Jupiter was at 4.6° altitude. Mercury is moving swiftly eastward and catching up with the sun while Jupiter plods eastward and is falling behind the sun and moving higher in the morning sky. Yesterday, October 11, when the pair was 0.8° apart at their closest appulse, I observed them visually from this location. Taken with a Canon 6D digital SLR camera and a Canon 400 mm f/5.6L lens on a fixed tripod. Exposed automatically 1/80 second at f/5.6, ISO 3200; auto white balance. Not cropped, so the field of view is 5.12° wide x 3.42° high. Mouseover for labels. The planets Mercury (above) and Jupiter (below) were 1.7° apart on October 10, 2016, when this image of them was captured at 6:24 am EDT from the old Mart site in Pennsauken, NJ. At the time, Mercury was at 3.9° altitude and is heading towards the Sun and superior conjunction on October 27. Jupiter was at 2.3° altitude and is moving away from the Sun after conjunction with it on September 26. Tomorrow, October 11, the pair will be just 0.8° apart at 6:30 am (essentially, their closest appulse for observers at 40°N-75°W). Taken with a Canon 6D digital SLR camera and a Canon 400 mm f/5.6L lens on a fixed tripod. Exposed automatically 1/20 second at f/5.6, ISO 800; auto white balance. Cropped slightly in the height to a field of view about 4.3° high x 3.4° wide. The radio tower is Philadelphia's 50 kW WPHT-1210 AM, located in Moorestown, NJ, about 1.8 miles away. Mouseover for labels. My initial spotting of Jupiter after it's September 26 conjunction with the sun was on October 6, 2016, with 16x70 binoculars at 6:27 am when it was at 0.9° altitude with a solar elongation of 7°52'. On October 3, 2016, the three-day old, 8% illuminated and earthshine-filled Crescent Moon was about 4.2° from Venus when this picture of them was captured at 7:40 pm EDT (62 minutes after sunset) from Swede Run in Moorestown, NJ. At the time, the Moon was at 6.3° altitude and Venus at 2.6° altitude. Taken with a Canon 6D digital SLR camera (on a fixed tripod) and a Sigma 70 to 300 mm f/4-5.6 zoom lens set to 168 mm focal length. Exposed one second at f/5, ISO 1600. Cropped in the width to a nominal 8° square. The star Zubenelgenubi (Alpha Librae) is 2.8° above-left of Venus (mouseover for labels). Note: The soybean field between the camera and the distant trees, which was a lush green color on August 26 (see the background in my picture of the 16x70 binoculars on that date), and had started turning yellowish by September 7, was straw-like stubble on October 3. Obviously, it had been harvested, recently I suppose, since there was still a harvester parked in the field.